The Oort cloud is the farthest from the Sun that you can go and still be in the Solar System. It is believed that most comets originate in the Oort cloud before "falling" toward the Sun. Scientists think that there is a group of rocks and ice that forms a cloud-like region surrounding our Solar System. It is a collection of comet like objects orbiting far away from the Sun. It is named after a Dutch astronomer Jan Oort who refined and popularized the theory. The comets in the Oort cloud are at distances of 50,000 to 100,000 times the distance between Earth and the Sun. That is 1,000 times further away from the Sun than Pluto is and about one fourth the distance to the nearest star. Light would take a year to travel that far. How did the Oort cloud start? 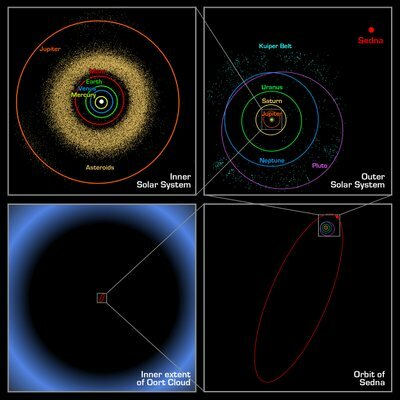 The Oort cloud objects may have started closer to the Sun during the Solar System's formation. Then gas giants pulled them far away with their gravity. The Oort cloud objects were sent in all directions, making the Oort cloud ball shaped instead of disk shaped. The gravity of other stars made the objects' orbits more circular, making the objects stay far away from the Sun. Maybe the gravity of other stars could sometimes send the objects back toward the Sun. We would see them as comets. One object discovered so far is Sedna. It is 1,180 to 1,800 km across. Its orbit stretches from 76 to 928 times Earth's distance from the Sun. Sedna takes about 11,250 Earth years to orbit the Sun once. The last time Sedna was where it is now in its orbit, Earth's last Ice Age was ending! Some scientists consider it an inner Oort cloud object. Others think that it should be included in the Kuiper Belt, making the belt bigger.